I was counting my last couple of days in Pokhara, Nepal when I met Myriam – a guest from Luxembourg – at the Castle Resort, Pokhara. She told me that she was going to the rice planting festival with her husband and offered me to join them. I agreed instantly and we took a taxi ride to the venue – which happened to be about 40 minutes from The Castle Resort. When we reached the venue, we got stuck in a traffic jam thanks to unorganized parking and muddy road. As the taxi was unable to move, Myriam and I decided to get off and walk. After walking through the crowd of vehicles and people for 10 minutes, we reached the rice field. In this article, I am glad to present my experience at the Ropain festival along with some photos. Ropain – which means ‘rice planting’ – is one of Nepal’s most important festivals. Celebrated every year on the 15th day of the month Ashar (Ashar Pandhra), Ropain marks the beginning of rice planting season. Nepal Government recognizes this day as National Paddy Day. On the day of the festival, locals and travellers join farmers in large rice fields to plant rice crops. 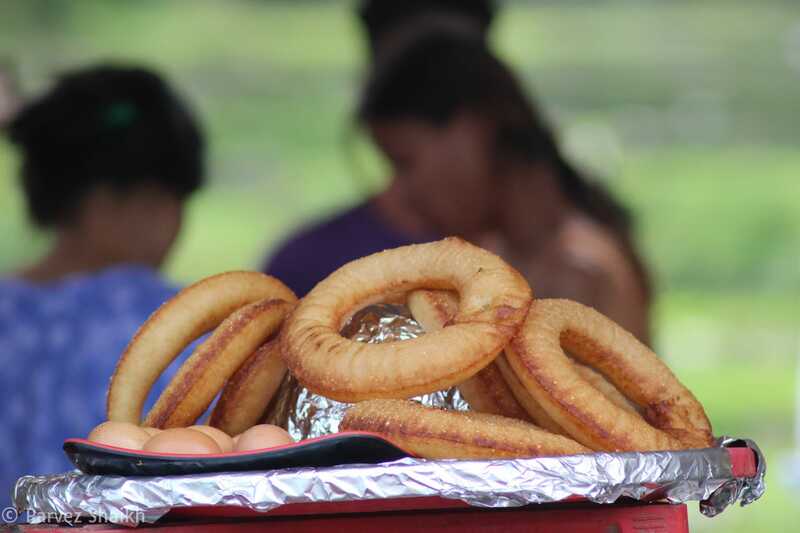 The day is celebrated with songs, dance, competitions, and playing in the mud. Rice planting is done by women on paddies plowed by men. Ashare Jhyaure geet (the monsoon song) is a common song being sung by these women when planting rice. The venue was full of locals who were dressed in beautiful clothes. Some tourists were also present there to enjoy the festival. Myriam and I walked to the rice field and had some Chiura – made from beaten rice and served with curd. After filling my hungry belly with some light food, I took a walk around – leaving Myriam and her husband Kumar to themselves. I walked to a place where some ladies were planting rice. It was hard to walk on a narrow path between paddies – especially with my flip-flops on. I almost slipped a few times – after which I was a pro in walking on the muddy path. I observed those ladies planting rice for a while before I started taking photos. The speed they were planting rice at left me amazed. Singing songs, talking and laughing – those lovely ladies were enjoying their time while I observed and photographed them from a distance. Some locals also joined these farmer ladies and enjoyed planting rice. 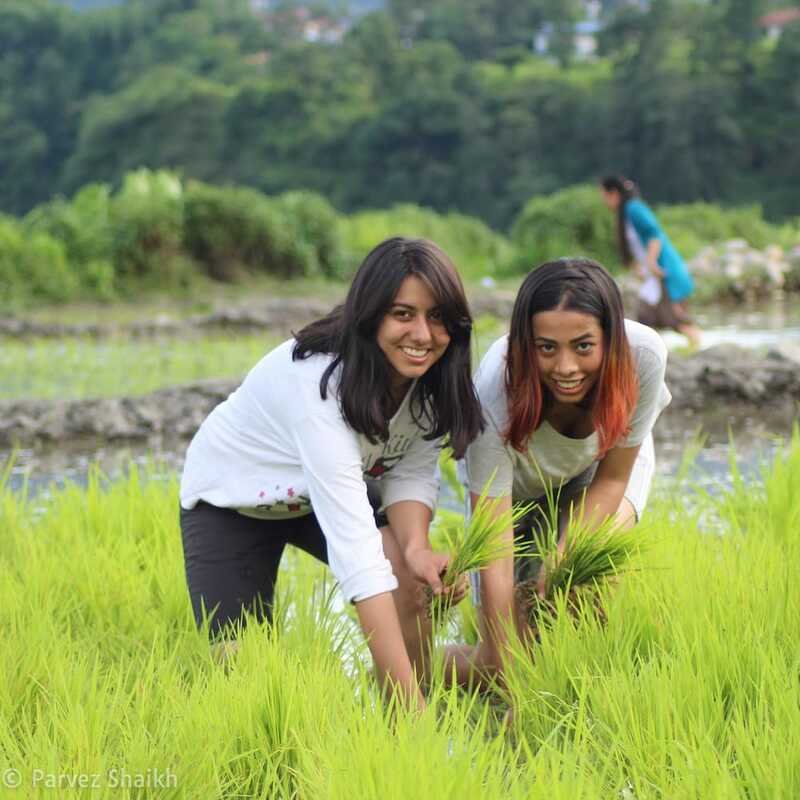 In the photograph above, two young girls from Pokhara – Salina (left) and Sanaya – can be seen enjoying their time planting rice crops. With modern technology taking over traditional ways of farming, many farmers start planting their rice before (and some after) the Ropain Festival. But for most farmers, this day means a lot. 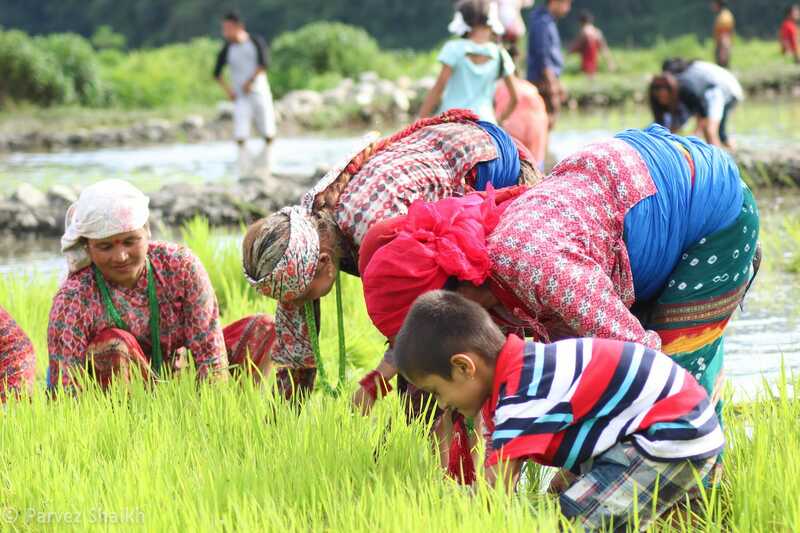 There’s a reason Ropain is referred to as a ‘festival’ because it rice planting is something Nepalis ‘celebrate.’ Farmers, locals, and tourists gathered here from different places sing, dance and have fun throughout the day. At the stage, they sang some folk songs to which the locals danced. In the rice field, women were humming songs on their own and dancing. Everyone was lost in the moment – getting the best out of it. The following photograph shows a farmer lady dancing to a folk tune being played on speakers. While Ropain festival is about planting rice for farmers, youngsters enjoy it in their own ways. This includes playing in the river and applying mud all over their bodies. At first, I could not understand while they were applying mud over their bodies. I thought it was holy or it made your skin glow. None of these assumptions turned out to be true as they were just playing in the mud – which is common during this festival every year. In the rice field, youngsters play in the mud, throwing it at each other. They won’t spare anyone if they spot someone with clean clothes and would throw mud at passers-by. Mud splashing and wrestling is common sight while farmers plant their crops. Some young men had their own idea of celebration – riding a motorbike around the field – splashing mud and water all over, much to everyone’s amusement. The festival ended about two hours before sunset – ending a day full of joy. One by one, everyone – including farmers – started walking towards the exit. 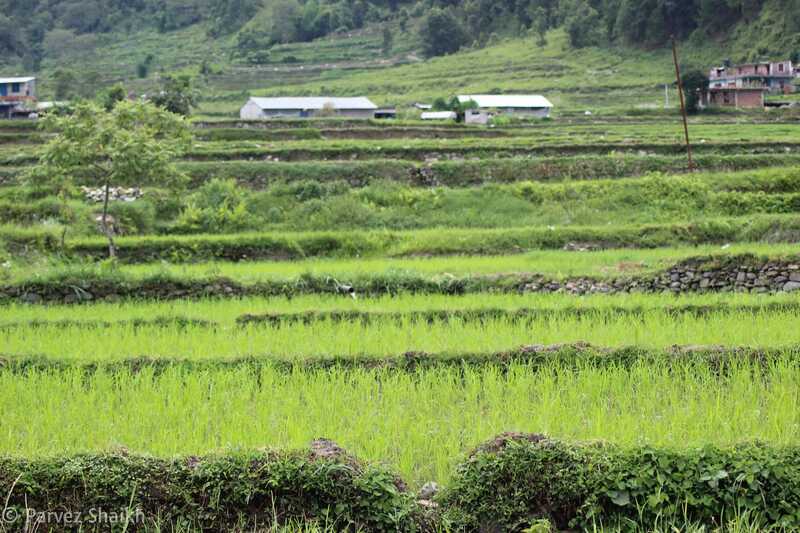 The rice planting day holds an important place in not only farmers but other Nepalis’ heart. They come together to celebrate this day by planting rice, singing, and dancing. Young or old, everyone celebrates this day with immense dedication. Throughout the day, farmers, locals, and travellers like me enjoy their time. I had a memorable day at Ropain aka Rice Planting Festival at Pokhara, Nepal. If you happen to be in Nepal during monsoon, I would suggest you visit a nearby rice field where a celebration is going on. I’m sure you will love it. That’s it, ladies and gentlemen! This was Parvez and you were reading an article about Ropian – the Rice Planting Festival in Nepal. I hope you enjoyed this article as much as I enjoyed my time at the festival, and then writing about it. Have you been to the rice planting festival in Nepal? How was your experience? Share it with me! Is something missing? Could this information be improved? Feel free to let me know.